The Community Action Poverty Simulation (CAPS) is a unique tool that community action agencies are able to use to educate everyone, from policy makers to local community leaders, about the day to day realities of life with a shortage of money and an abundance of stress. CAPS is a copyrighted tool made available by the Missouri Association for Community Action to organizations that want to promote a greater understanding of poverty. 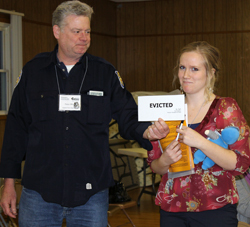 During a simulation, participants role-play the lives of low-income families, from single parents trying to care for their children to senior citizens trying to maintain their self sufficiency on Social Security. The task of each family is to provide food, shelter and other basic necessities during the simulation while interacting with various community resources staffed by low-income volunteers. Although it uses “play” money and other props, fictional scenarios, and time limits, CAPS is not a game. It is a simulation tool that enables participants to view poverty from different angles in an experiential setting, while empowering low-income volunteers by allowing them an opportunity to interact with leaders from their community. Who might participate in your poverty simulation? Local human service agency personnel; church staff, volunteers and clergy; school faculty and staff; high school and college students; community leaders and volunteers; government officials and policymakers, employers; law enforcement officials and many others.